This isn’t really how it happened. Being mediocre is not a title you win in an award show. It’s more of a feeling. Your clients are happy with your work. You like what you do. But at the same time there is a feeling that no one will miss you if you’re gone. You can be easily replaced with someone that can do the same semi-decent job. Maybe it’s because designing digital products is not that hard; it’s just some pretense colleagues of mine use to make it look like it is. I don’t know. At some point I was considering becoming a developer, and then I realized that learning a programing language is too hard. Too many rules. So I stuck with designing, solving imaginary problems visually. For someone with an art background this is not that hard, but then it turns out this is not going to cut it. Now designers have to write to explain themselves, as a way to prove their value and attract clients. I’ve always found contemporary art pieces that come with a two-page explanation of what it is a bit stupid. Now I feel I have to do the same. How do you produce decent written content without feeling like you’re wasting your time and the time of a potential reader? 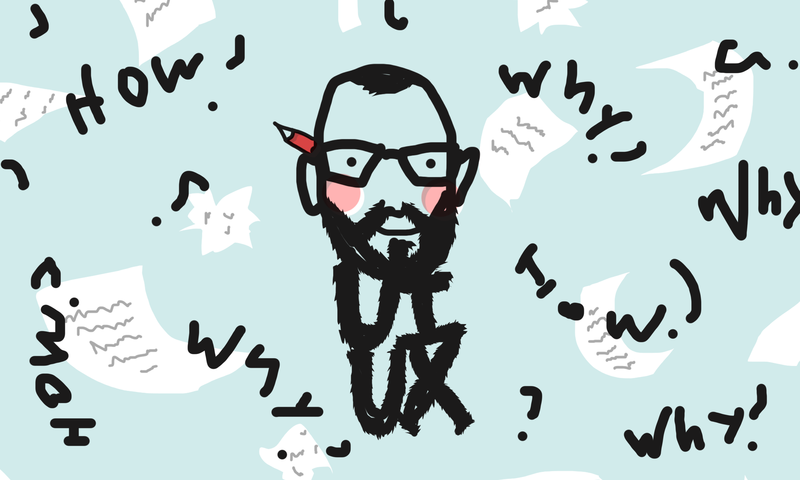 After all, I read tons of articles about UI and UX design and listen to a good amount of podcasts about it. How do you create something to match your own expectations? Or at least make it palatable? They say to be a good writer you have to read a lot. I don’t. I found reading few years ago as a way to educate myself. So I read mainly non-fiction, and listen to audiobooks. I don’t wanna do all the topics that have already been recycled a million times, and add to the content pollution that is spreading all over the place, giving second-hand advice and making politically correct statements about the industry that anyone can agree on. It should be something more experimental. And kind of personal. This will keep me interested. I have to be able to produce at least one article a week. And somehow make it fun for myself. I found this structure of a design case study. I’ve already used it a few times for projects on my own websites. It works for me. I’m not starting from a blank page. Listing the sections and adding a few bullet points for each one removes the anxiety of not knowing how to start. It acts as a wireframe for the article you’re creating. Hiring an editor to save me from my embarrassing grammar and spelling is probably the most liberating thing. I mainly use Fiverr for this. I’ve tried Upwork for finding editors too, but honestly I can’t see much of a difference. And Fiverr is much more affordable. This I will enjoy the most. It’s the fun part that I hope will keep me doing this. I have a previous practice of doing illustration work for editorials and a bunch of personal projects. I like experimenting with styles and techniques. Maybe this will keep people scrolling. Or scare ’em off. I will see. I have a list of 20+ topics that sounds like something you can read on the UX Collective or InVision blog, and I’m not really excited to tackle any of it. Maybe if try to mock them I will kinda get some fun out of it. But sarcasm doesn’t come across very well in written form, especially when you don’t know what you’re doing. This is a unresolved issue for me. How do you balance between what people care to read and what you care to write about? What is something that only I can write about? What is the unique perspective I have? Maybe I don’t have one? Who is searching in Google “How to be a mediocre UI/UX designer”? I think this is the title of my next post. We’ll see. Well, this is my first attempt. It sounds like I’m some sour guy that complaining. I’m not. This is what happens when you don’t know how to write. The results don’t match your intentions. I hope this changes with practice. Is that what people say at the end? I think I have to write a bit more before I earn the right to say this kind of things. But nevertheless, I will appreciate a clap or two if you find this not so bad. Here is the place where I casually mention the URL of the company I work for — Evermore. So you can go there and ask us to take a pile of ideas and turn them into a super awesome custom software.